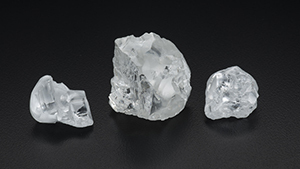 Showing 5 results for "*"
This is an extended abstract of the article ‘Blue boron-bearing diamonds from Earth’s lower mantle,’ published in the 2018 August issue of Nature. GIA Researcher Evan Smith is the lead author of the article. This is an extended abstract of the article ‘Large Gem Diamonds From Metallic Liquid in Earth’s Deep Mantle,’ published on December 16, 2016 in Science magazine. GIA Postdoctoral Research Fellow Evan Smith is the lead author of the article. Article was published in Lithos Volume 265, 68-81. Article published in Precambrian Research 286, 152-166.